More than 90 years ago, our family-owned business began providing homes and businesses across Maryland with quality heating fuel and prices. 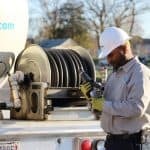 By treating our customers like family, we became unique among other propane companies in Calvert County. We also became the go-to source for propane deliveries in the County because of our focus on you, the customer. Emergency service: Making sure you and your family stay warm throughout the year is important to us. That’s why we offer emergency service that’s available 24 hours a day, seven days a week and 365 days a year. Contact our caring and knowledgeable live representatives to restore your home’s heat. SmartPay Budget Plan: Roll out your heating bills across the year with our SmartPay Budget Plan. This free service estimates your average annual fuel use and then calculates a low payment for each month of the year, which makes our propane heating prices in Calvert County even more competitive. Delivery: Organize your fuel deliveries how you want with SMO Energy. Use our automated phone system, talk to a representative or schedule a delivery online. You can also eliminate the hassle of arranging a top-off with our free automatic delivery program. Online account: Manage your account with ease through our free portal account. Here you can view your latest statements, request a delivery or service, pay your bills and much more — all from the convenience of your home. Propane consultations: With the expertise of our team, we’ll help you find the right replacement tank to lease or purchase your home. Our technicians will also install and connect the equipment for a seamless installation. Propane conversions: Make the move from heating oil to propane with the SMO Energy team. While our heating oil prices for Calvert County are competitive like our rates for propane, propane is more cost-efficient and effective. It’s also a cleaner energy solution and comes with a credit of up to $1,000. Propane installations: Families across Calvert County choose our propane specialists for installing their new or leased propane tank. Our team follows the most comprehensive safety measures and standards, from obtaining the required permits to ensuring your tank size is the best one for your needs. To maintain your propane tank, we also provide preventative maintenance services. With more than nine decades of experience, we’ve developed a new way to deliver propane. One that’s dedicated to providing you and your family with quality fuel, unparalleled service and exceptional staff that’s ready to help you in emergencies and more. Find out more about our services by asking for a free quote today on our propane heating prices for Calvert County.